Even during half term our staff are working around their families and yours. Our handyman is currently laying flooring in one of our client’s homes so the whole of the downstairs is upside down and not accessible to clean so I’ve been working around him and doing extra work on the upstairs of the property (being flexible is paramount for busy families). From stripping and changing your beds to getting on top of the ironing load that never seems to be going down. Every little helps when your life is as busy as everyone’s seems to be these days – but we are here to make yours easier. 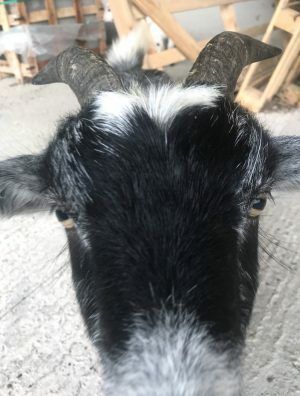 One of our housekeepers absolutely loves going to work as one of her clients is on a local alpaca farm which is also home to some very naughty goats! They often stand at the window and chat away to her, well so she thinks, and the pictures we get of the cheeky goat when it’s up to no good or the messages to let us know what they have been up to keep us all entertained. We are all a bunch of animal lovers and often have our director’s shih tzu, Minnie, in the office – so hearing what the alpacas and the goats have been up to have us laughing out loud. From goats pinching washing to alpacas acting like dogs and refusing to walk on their lead ropes whilst flopping to the ground in protest they’re all highly entertaining. So, as you can see – not one day is the same, and no house is the same, but every house is treated with the same absolute respect – and our client’s minds are at ease knowing their housekeeper is fully insured and the products we use have the health of our staff, and your family, at heart. March approaches at speed so let us help ease your stresses whether it be one of our girls adding half hour on to your weekly clean, to do that extra ironing, or our Joiner calling to by to get that curtain pole hung that’s been sat in the corner for a month, or even lay some decking for the upcoming summer – drop us a line as we want to help. Are your drains in the kitchen or bathroom starting to smell? Try adding a cup of baking powder to your plug hole and pour some white vinegar over it – allow to sit for as 10 minutes. Boil your kettle and pour down some boiling water to rinse. DONE! No harmful chemicals needed and its much cheaper and easier than buying the harsh noxious products from the supermarket. Take care of each other and remember it’s nice to be nice.